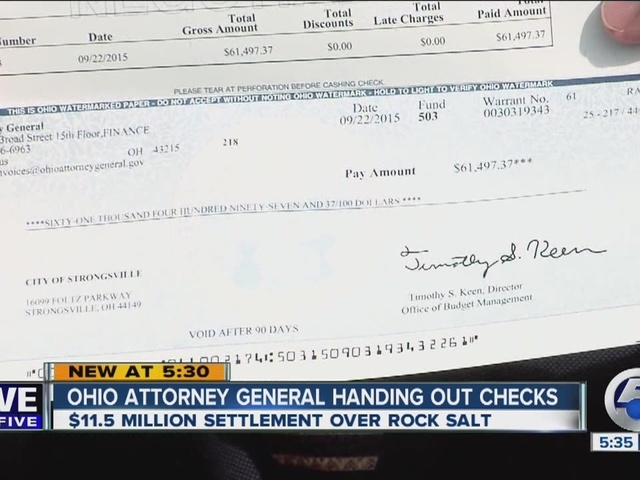 The Ohio Attorney General was handing out checks on Thursday to the tune of millions of dollars. It's all thanks to a settlement over rock salt used on Ohio roads during the winter. Cleveland and Akron combined to receive nearly $400,000 after Attorney General Mike DeWine resolved an antitrust lawsuit against Cargill Inc. and Morton Salt Inc.
DeWine claimed Cargill and Morton worked together in dividing up the state so they would only bid on their decided-upon cities and not compete with each other. The companies admitted no wrongdoing, but agreed to pay $11.5 million. Our camera was there as the checks went into the hands of local city leaders. These amounts were based on salt purchased between 2008 and 2010. City leaders thanked the AG's office for the much-needed money. "We have almost as many miles of roads as the entire Ohio Turnpike to maintain,” said Strongsville Mayor Thomas Perciak. “Every dollar counts in our community and you can imagine what this means to us." Perciak said the money will help keep a police officer on the streets. ODOT was the largest buyer of salt and received $1.7 million. The Ohio Turnpike Commission got a $174,435 check.